Bellaire, Mich. – Short’s Brewing Company is celebrating the eventual coming of spring with the release of their spring seasonal. Short’s, Northern Michigan’s largest craft brewery, is excited to offer ControversiALE in bottles and kegs throughout the state of Michigan. ControversiALE (6.0% ABV, 65 IBU) is an India Pale Ale brewed as a tribute to Simcoe hops. Available from February through May 2014, ControversiALE is the second of five seasonal beers being released throughout the year. Following will be Nicie Spicie (June-August), Autumn Ale (September-October), and a Stout that is yet to be determined (November-January 2015). ControversiALE is hopped like an IPA, but drinks like a Pale Ale. This beer has an earthy, citrus and pine-laced aroma. A large amount of toasted grains and high alpha hops form a perfect union that creates the sensation of toasted sourdough covered with grapefruit hop marmalade. The light, refreshing qualities of this beer make it the perfect beer for the welcoming of spring. 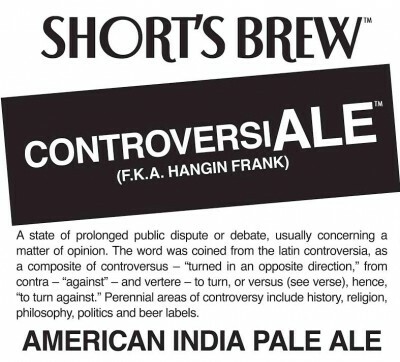 Originally brewed for Park City Grill in Petoskey, MI, ControversiALE soon became a fan favorite at the Short’s brewpub in Bellaire and a favorite among the Short’s staff. Due to its popularity, it was bottled as a limited specialty release. The bottle version was so well received that when Short’s decided to create a seasonal beer series, ControversiALE was chosen for the spring release. This beer is one of 43 different beers available in 6-packs that are scheduled to be released in 2014 throughout Michigan. The full list of bottles being released can be found at http://www.shortsbrewing.com/beer/beer-schedule-2014/.